Cook , Joseph , Peter Kimuyu and Josephine Gakii Gatua. 2016. 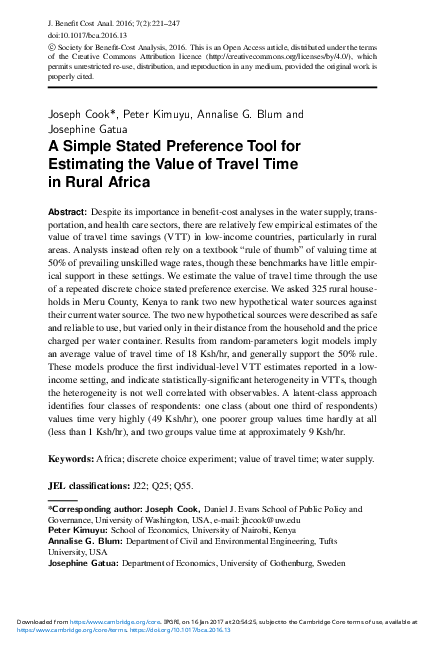 “A Simple Stated Preference Tool for Estimating the Value of Travel Time in Rural Africa.” Journal of Benefit-Cost Analysis 7:2: 221-247. Despite its importance in benefit-cost analyses in the water supply, transportation, and health care sectors, there are relatively few empirical estimates of the value of travel time savings (VTT) in low-income countries, particularly in rural areas. Analysts instead often rely on a textbook “rule of thumb” of valuing time at 50% of prevailing unskilled wage rates, though these benchmarks have little empirical support in these settings. We estimate the value of travel time through the use of a repeated discrete choice stated preference exercise. We asked 325 rural households in Meru County, Kenya to rank two new hypothetical water sources against their current water source. The two new hypothetical sources were described as safe and reliable to use, but varied only in their distance from the household and the price charged per water container. Results from random-parameters logit models imply an average value of travel time of 18 Ksh/hr, and generally support the 50% rule. These models produce the first individual-level VTT estimates reported in a low-income setting, and indicate statistically-significant heterogeneity in VTTs, though the heterogeneity is not well correlated with observables. A latent-class approach identifies four classes of respondents: one class (about one third of respondents) values time very highly (49 Ksh/hr), one poorer group values time hardly at all (less than 1 Ksh/hr), and two groups value time at approximately 9 Ksh/hr.